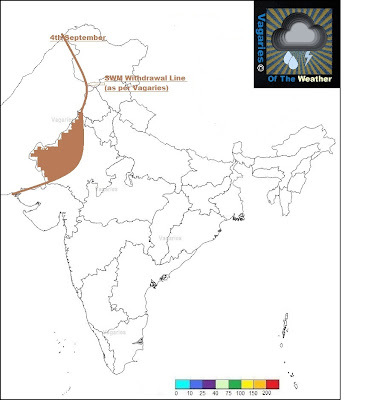 4th September..The South West Monsoon has withdrawn from West Rajasthan (as per Vagaries' observations). The Seasonal Low a the western End of the Monsoon Axis has weakened to 1002 mb. Resultantly, the Monsoon Axis itself has weakened. The East Coast trough will form in the Bay by Thursday, but move towards the coast by Saturday. On Thursday and Friday, there may be some heavy rains in parts Northern TN districts of Vellore and Thiruvallur, and adjoining Districts of AP. Coastal AP too, gets heavy rains from the trough. Mumbai: As usual, cloudy morning, precipitating showers in some parts. Rainfall 5-7 mms.Clearing later, and re-grouping by evening. Outer Townships will have same pattern of morning showers. Clearing, and getting Cb clouds by afternoon evening. Rains upto 10 mms. Some isolated showers in the ghat areas. Rains increasing as mentioned after 10th, Ganesh Chaturthi. Chennai: Less chances of a rain cloud or TS hitting Chennai these 2 days. Increase in rains on Saturday and Sunday, with Thunder showers precipitating upto 40-50 mms in some areas. Delhi NCR: Warm and hazy at 37c..with almost clear skies and strong dusty West winds. Night temperatures may drop to around 24/25c. Surat: Partly cloudy with upto 10 mms rain on Thursday. Decrease in rains on Friday. Pune: Cloudy in the afternoon and evening. Pleasant mornings at 18/19c. Bangalore will be partly cloudy with showers in some parts. But a pleasant day at 26c. The prevailing UAC in the South Arabian Sea near Lakshadweep Islands has weakened, but has descended and formed a sea level trough off the Karnataka/Kerala coast. This development happens sometimes, and not always assured, but will be temporary and should disappear in 24 hrs. But, while it will bring rains to the West, hopefully, it should not weaken the corresponding upper trough and off shore trough along the TN coast. Else, we see the rainfall along TN suddenly decreasing. Maybe you are true. Navi Mumbai today early morning - dawn had torrential storm like rains - non stop for hours together. Looks like Rajesh sirs ganapati rains prediction are taking shape? As predicted by rajesh sir , rain's for sure will increase for konkan , heavy rains will be there on entire west coast along with southwesterly winds. Hope ganpati bapa get some good rain along ..it has been very hot past some days..august rains also way below average. Heavy rains in Vasai as usual for 12 mins. If thundershower starts from 10 sep, does it mean the monsoon will withdraw from mumbai n around by 17 sep. Looking at the weather for the past two days; it seems monsoon is in its last legs here - practically withdrawn. Unlike last year, there's been no thundershowers as well. the weather for the past two days has been dry - max temp has gone up a notch and minimum has dipped by two degrees as well. and the predominant wind direction has been from the west. Rajesh sir, what's your expert interpretation. Its very dry in Chennai for the past few days..the usual intense Sep thunderstorms are missing..only hope is the upcoming low near South AP coast..
Looks like the low entering from Andhra Pradesh will benefit Mumbai Konkan Goa karnataka kerela, may be even south gujrat. Heavy rains started in some parts of Chennai now..definitely not due to heat or thunderstorms..clearly due to a developing system..low is forming!! !..NEM like climate here and clouds coming from NW with strong winds from NE/E..
satellite shows highly disorganized clouds over TN/AP. Looks like disintegrating fast. This is the only hope for south to get some rains - interior KAR,TN,AP. Hope this does not become like Jaal cyclone (for namesake it was cyclone without rain)- apparently it produced lots of rain over Konkan and not over place of origin (near TN). Now I think Samji is hinting same? 2013 year memorable lows was over Vidarbha (multiple times BB produced 300mm,200mm,400mm of rain in 24hrs). Konkan had trough since june. Will this hold for current low over south? vinod/kp: Monsoon withdrawal has started from Western India. Mumbai will surely get thunder showers from next week as given in the blog. But, predicting exact withdrawal date is difficult, as any situation may change the scene, but possible that Mumbai can see monsoon withdrawal by around 25th Sept. Will keep on updating the situation. sam: as on now, sems the system will cover karnataka and move into the sea off Goa. as i explained before, the morning condensation and lesser humidity in day can produce morning advent showers. Neeraj: I feel, theat as the axis has weakened (which i mentioned), the rainfall activity in Kathmandu has reduced. Soon, the axis will move South. This could (and will) revive the thunder showers in Kath. These, from next week, will mostly be the parting showers for the monsoon. next week should see the axis moving south. The faster it shifts, the faster the rains decrease in Nepal. Subsequently, the winds should change direction. sset: System moving thru Karnataka this weekend,and i expect heavy rains in Blore.